This was the first time I went to De Laantaarn in Hellendoorn. The guys from SympHel have organized many other concerts at this venue before, but most of the time it involved bands that would also play other venues closer to home. 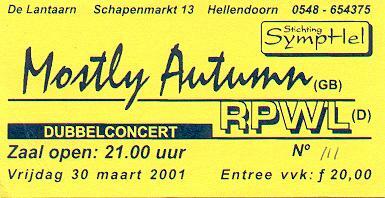 This time however, the program featured the second Dutch gig for Mostly Autumn and the first ever gig in Holland for RPWL. Since I've been very impressed by both, it was time to go and check out De Lantaarn. De Lantaarn turned out to be a nice venue, able to hold about 500 people. Behind the stage a red curtain had been hung, which gave the stage a very warm and cozy look and gave the gigs a rather intimate feel. This was actually a very good thing for Mostly Autumn, since their lightshow was basically non-existant. Fortunately, there was enough happening on stage to keep the crowd happy. The stage was almost too small for this 7 piece band; Bryan Josh (vocals & guitar), Heather Findlay (vocals, percussion & acoustic guitar), Ian Hennings (keyboards), Lian Davison (rhythm guitar), Angela Goldthorpe (flutes & backing vocals), Jonathan Blackmore (drums) and Andy Smith (drums). Every now and then Angela Goldthorpe would disappear from stage when she would not play her instrument in a certain song. I had seen Mostly Autumn at the Withchurch 2000 festival and had been very impressed by their mixture of Floydian prog rock with folky Celtic influences. For me, they were one of the highlights of the legendary festival. While I initially came to this double concert for RPWL, I was delighted to find Mostly Autumn supporting for them. Anyway, after releasing their first two well received albums For All We Shared and The Spirit of Autumn Past, the band have recently released their new album The Last Bright Light. The set featured a mixture of songs from these three albums. Old time favourites like Nowhere to Hide, Winter Mountain and the beautiful Evergreen were played side by side with new tunes like Hollow (a nice ballad with fragile vocals by barefooted Heather), Helm's Deep and the folky Which Wood ?, a composition by Angela Goldthrope which basically is a folky flute melody getting played progressively faster. All musicians played very well, but Heather and Bryan definitely stole the show. Bryan, who looks like a late eighties version of Steven Rothery and plays like a new David Gilmour, entertained the crowd with some delicious solos. To treat the Floyd-minded crowd, they also performed a nice version of Comfortably Numb, which could be described as the 'Pulse version' with an additional uptempo section during the second (long) guitar solo. All in all, Mostly Autumn played a highly enjoyable gig. If these lads and lassies play anywhere near you, make sure you check 'em out ! After a quick equipment change it was time for the German RPWL. RPWL has a long history as a Pink Floyd cover band. In 1992, some of the musicians in RPWL releases an outstanding album called Terminal Breath under the name of Violet District. Last year, RPWL, a new incarnation of the band released the well received debut album God Has Failed. They were also runner-up in the best newcomer category of the DPRPoll. More than enough reason to go and see if these guys would play as well live as they sounded on the album. When the band started playing Hole in the Sky and the soundeffects at the start of the song sounded through the hall it became immediately clear that they were using a quadrophic sound system, in true Floydian style. This proved to be a very nice gimmick indeed since soundeffects and synth noises would at times be in front of you, at times behind you, or going round you in 360 degrees. The band played as a five piece. Normally the band consists of Yogi Lang (vocals, keyboards), Karlheinz Wallner (guitars), Phil Paul Risettio (drums) and Chris Postl (bass). However, since the band is playing live, they have added an extra keyboard player, Wernthaler, to the line-up. During the gig Wernthaler would play most of the keyboards, with the exception of Cymbaline, during which he would disappear from stage to make room for Yogi behind the rig. Yogi himself would often grab a portable Moog keyboard during the gig to play additional solos. Unfortunately this didn't always turn out 100%; some of the stuff he was playing on the Moog just didn't seem to be completely the way it was meant to be. I don't know what caused this, but I did sometimes get the impression that the front man was under the influence of some sort of chemical or alcohol. He would speak in a rather spaced out way, would anounce their own material using the wrong titles (for instance, he anounced Fool as 'Sun of Coloured Amber' and What I Need as 'Leaving', which according to the CD is just the title for the first part of the song). No real connection was made between him and the audience since he hardly made contact. Therefore, although he is a fine musician and splendid vocalist, he certainly wasn't the perfect frontman (yet). I had the impression that bass player Chris might do a much better job. He was obviously having the time of his life and would often throw big smiles and funny faces to the audience. For a Floydian band he seemed much more like a Chris Squire type than a Roger Waters clone. This didn't only come across in the way he dressed (a styleful long black jacket), but also in his stage presence and the way he handled his instrument. If there was still any doubt, the obvious Yes-inspired Spring of Freedom, which featured an additional bass solo, made it perfectly clear where his inspiration comes from. The whole of the band was clearly enjoying themselves and some of that attitude definitely rubbed off on the audience. The band played most of their debut album (10 out of 13 songs), and they all were fine renditions, with the occassional improvisation or extra solo. Highlights among these songs were the Floydian Hole in the Sky (very well received as a set opener and featuring an extra guitar solo in the second part instead of the ambient/psychadelic effects) and the powerful It's Alright (more powerful stuff like that one on the next album please). The band also played a song which was anounced as an older tune, Just The Way It Is, but unfortunately didn't play anything from the Violet District reportoire. What they did play was some material by Pink Floyd, what was to be expected of a former Floyd cover band. Fortunately the band hadn't picked cliche tracks like Comfortably Numb or Shine On Your Crazy Diamond. Instead they performed Welcome to the Machine, Dogs and the highly underrated Cymbaline from the 'More' album (not Fat OIld Sun as SympHel mentioned in their program). The latter song was performed in the version the band contributed to the Pink Floyd tribute album Signs of Life. This version, which incorporates the Funky Dung section of Atom Heart Mother, was as enjoyable as it is on the tribute album. I had certain doubts about the other two songs. While it might have been what others in the audience were waiting for, they were a bit disappointing to me. The music was okay as far as I was concerned, but Yogi screwed up the lyrics several times in both songs. The occassional Floyd listener might not have noticed, but some long-time Floyd freaks were throwing each other glances or would cringe every now and them. I was one of them. Especially Dogs seemed rather messy and Yogi skipped a whole verse ! What really put me off was that after playing this strange version of Dogs he told the audience that this was an early version they played live in 1974. This is pure nonsense ! As any self-respecting Floyd collector knows, RPWLs version wasn't anything like You've Gotta Be Crazy, as Dogs was called in 1974. The band might get away with this with a not-so-well-informed audience, but not with me. Still, those were all minor complaints in the context of the whole gig. It's not often that you'll find a band with such an unimaginative name play such enjoyable music ! As I've said in the CD review, these guys don't need all those obvious Floyd and Beatles references in their music to make an impression. Still, if you like Floyd, Beatles and Yes, go see this band, go get their album. They're great ! All in all I had a good time, regardless of the sometimes loud and uninterested folks in the audience. Thumbs up for SympHel for another great concert !